** Are we running a pre-Vista version of Windows? ** the default, let's make it 1pt smaller. MESSAGE "Removes the selection and places it onto the Clipboard"
MESSAGE "Copies the selection onto the Clipboard"
MESSAGE "Pastes the contents of the Clipboard"
MESSAGE "Removes the selection and does not place it onto the Clipboard"
DEFINE BAR 5 OF shortcut PROMPT "-"
In effect, whenever the Value property is EMPTY(), we’ll display the CueText in the textbox. Anytime the textbox gets focus, we’ll set lCueVisible to .F., which will update the textbox accordingly. 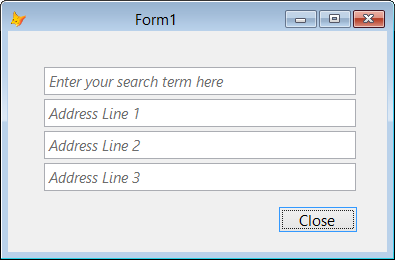 Admittedly, this is a pretty basic example, but this type of textbox has great potential for enhancing the UI of my Visual FoxPro applications.